A large and costly program to address one of China’s most challenging ecological problems is making things worse. The Great Green Wall, also known as the Three-North Shelterbelt program, started in 1978 with the goal of establishing 35.6 million hectares of protective forests over a swath of 2,783 miles in Northeast, North, and Northwest China. The program was to take 73 years and raise forest cover in northern China from 5 to 15 percent. The program intended to improve ecological conditions in northern China and address the problem of desertification. China lost more than 600 square miles of grassland each year to desert-like conditions at the time when the program was established. The ambitious tree-planting program is fundamentally flawed, according to researchers. Jiang Gaoming, a renowned ecologist from the Chinese Academy of Sciences, believes that northern China is not suitable for extensive tree planting. “We would say that they are trying to make forests, that is, planting trees in areas that did not have forests distributed, or are at least treeless in the last several thousand years.” Said Jiang on his personal blog on Feb 17, 2008. Annual precipitation in these areas is generally less than 15 inches, and natural vegetation is grassland or desert. Stories of failure in tree planting abound in northern China. Well-known is Gansu province’s Minqin area, a dry desert with annual rainfall of 4.5 inches. Of the 53,000 hectares of trees planted in the last few decades, a quarter has died and the rest are dwarf trees, lacking any capacity to protect the soil, according to a report by Karen Bennett of World Resource Institute. Worse, as tree planting and irrigation used more water in Minqin, the groundwater level dropped by 39-62 feet, and in some cases, even 131 feet, the Bennett study showed. 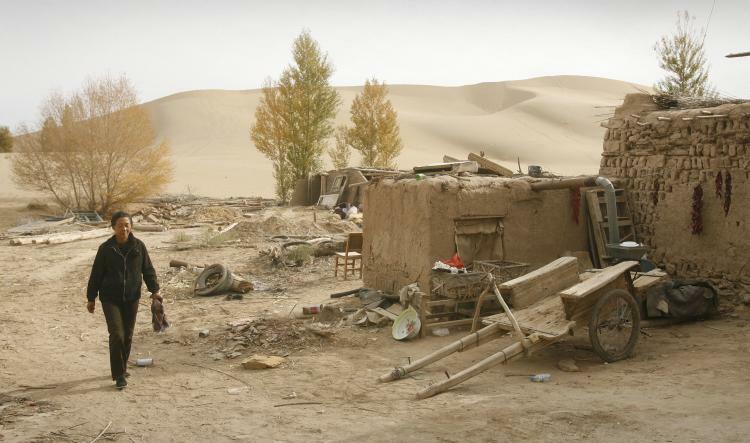 Tens of thousands of people have left the area, and Minqin is expected to be swallowed by desert in the next decade. The Chinese authorities, however, have reported successes in tree planting. By late 2008, the agency in charge of the Great Green Wall program, the State Forestry Administration, claimed to have established over twenty-four million hectares of forests, raising forest cover from 5 percent to 10.5 percent in northern China. Studies show that success in tree planting is contained to certain limited locations, while on the large scale, degradation in dryland continued unabated. According to research done by the Chinese Academy of Sciences, the annual desertification rate increased from 602 square miles during the 1950s-1970s to 811 square miles in the 1980s, 950 square miles in the 1990s, and 1,327 square miles at the turn of the twentieth century. The state Forest Administration’s report of abatement since 2000 has not been validated by independent research. Of the forests established, researchers point out many problems, including single-species forestry. In Ningxia, for example, 70 percent of the trees planted were poplar and willow. In 2000, one billion poplar trees were lost to a disease (Anoplophora), wiping out 20 years of planting efforts. The vulnerability to disease, compounded with its rapid exhaustion of soil and water resources, makes single-species forests “green deserts,” according to agro-botanist Zhang Yan. Single-species forestry helps increase the official tally of trees, but it fails to improve the environment. Exaggeration in tree-planting reporting adds to further problems. Jiang Gaoming has questioned the inclusion of shrubs as trees, and the counting of dying or dwarf trees as forests. Tree planting has been costly, and survival rates are low. Journalist Weng Bao reported that per-hectare tree planting requires 2,250-15,000 yuan (US$330-2,200) in investment depending on how dry the location is. This cost does not consider replanting and death after the initial establishment. “[We] absolutely cannot guarantee planted trees to survive, and must replant them in 3-4 years.” Said Wang Man, the head of the Forest Bureau in Zhangbei of Hebei province. Cao Shixiong from China Agricultural University estimated that of all the trees planted on dryland since 1949, only 15 percent survived. To be sure, problematic tree planting is not limited to China. Stalin’s "Great Plan for the Transformation of Nature" in 1948 achieved an astounding failure of less than 2 percent survival rate in tree planting on the dry steppe zone, and has now become a textbook example of ecological plunder. Interestingly, China’s Great Green Wall program has similarly sought to plant trees on dryland in a program rooted in an aggressive attitude toward the environment. Are there viable alternatives to tree planting to improve the dryland environment? One answer: “nurturing the land by the land itself,” as Jiang Gaoming calls it. Jiang and his team of scientists have successfully restored the grassland in Inner Mongolia’s Hunshandake sandy land by simply fencing the degraded area to remove human use for two years. This research has made Jiang a champion for nature’s capacity for self-recovery. But the Chinese authorities are not listening. Official policies have not considered natural recovery important and have devoted little funding for it. Instead, the central government continues to push ahead its 73-year plan to build the “Great Green Wall” of forest. Hong Jiang, Ph.D., teaches geography at the University of Hawaii, specializing in the cultural geography of the environment, environmental politics, and resource use in China.